It combines the charm of its narrow cobbled streets and exotic white-washed quarters like the Alfama with modern shaded avenues and parks. It is the only capital city in Europe where the sun sets over the sea. With its lace-like carved buildings like the Monasterio Jeronimos or Torre de Belem and bright yellow street cars and street elevators buildings covered by tiles the city tells stories. During your stay in Portugal's capital do not forget to listening to the fado songs in which Portuguese souls sing their fate. Accompanied by the guitar, the fado tells a story of the sea, around which the whole Portuguese nation rallied. The words of each song sing the soul of that people, intermingled with the yearning for those who have gone away, and the anguish of those left behind who, in Lisbon’s port awaited the arrival of the ships which did not always return. b. Full day excursion with lunch to medieval Obidos, Alcobaca, Batalha monastery and Fatima. c. Full day excursion with lunch to Evora, the Unesco World Heritage site with wine tasting in the region of Alentejo. Optional evening Fado show with dinner: Euro 79 per person. Airport or railway station transfer euro 20 per person per direction. During Christmas, New Years , Easter and other special holidays and fairs surcharge apply! 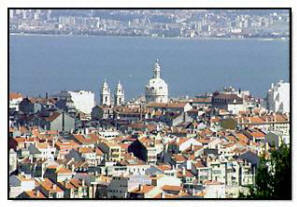 City packages in Porto and Faro available on request. Please inquire!